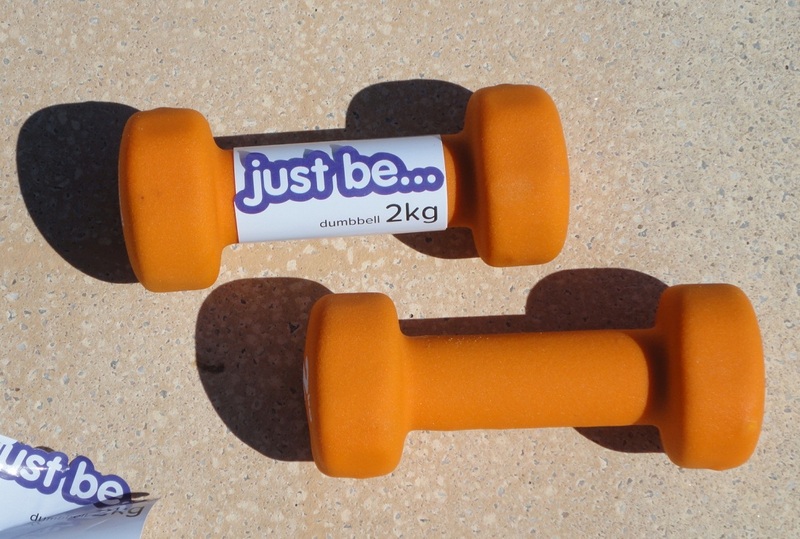 A pair of dumbbells that I actually love to use. My husband has free weights that I sometimes borrow, but they start at 7 kg, which is, frankly, too much for me. These are made for us ladies, with many features that make them a joy to use. First of all they are entirely coated in a roughed-up, anti-slip neoprene skin which gives great grip and some cushioning, so I don't need to use gym gloves. They are colour-coded; if you buy several sets, you will know immediately which are which just by looking at them. The ends are squared off, hexagonal in fact, to stop them rolling away when you set them down. The grip in the middle is thick enough to hold without straining and wide enough for a male hand as well (inside measurement: 10 cm or 4 inches). 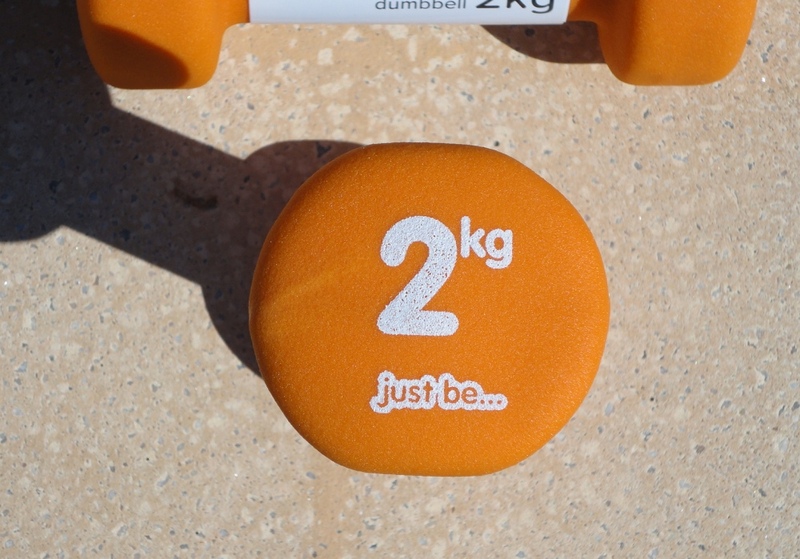 They are available in several weights, from 0.5 kg to 5 kg. The ones I was sent are 2 kg (each, that is), a bit too light for what I need but still useful by upping the reps. If you are new to weights, it would be a good starting point. 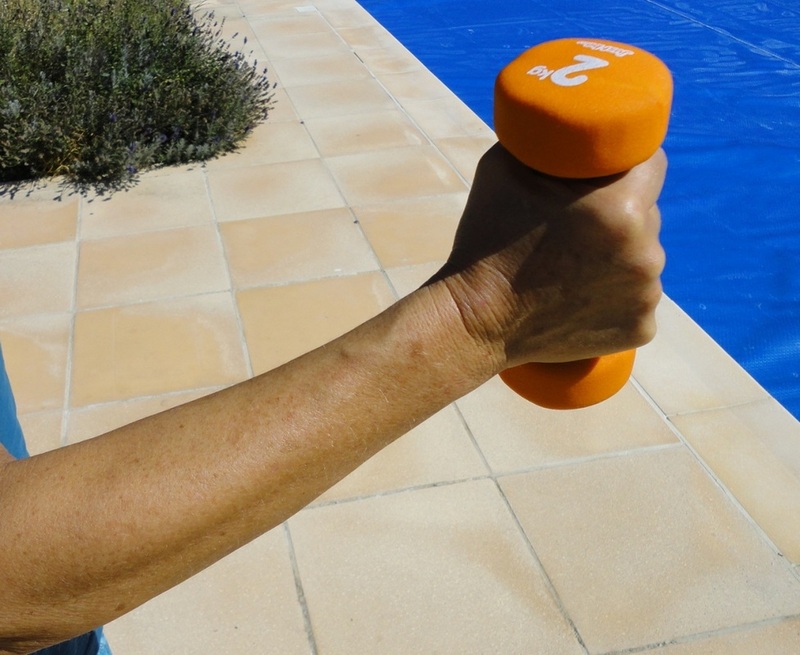 The price is attractive; for a relatively small investment you can outfit your home gym and get motivated to add weight training to your fitness routine. I find them really comfortable to use. 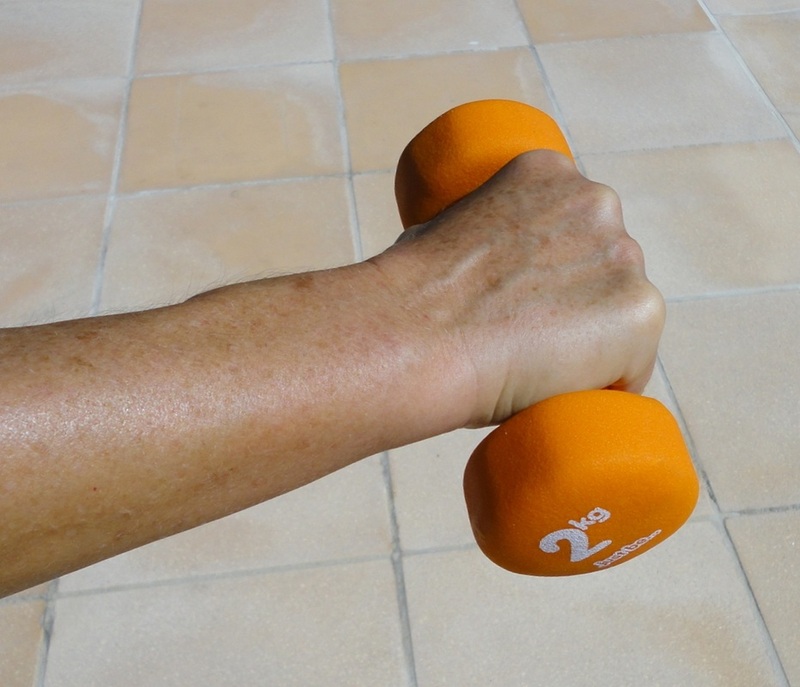 It's easy to pick them up any time and do a quick set without going looking for gym gloves or risk calluses on my hands. The coating seems durable for normal use, but only time will tell. For now they still look brand new after three weeks of regular use. With tiled floors in every room and area rugs here and there, doing floor exercises without a gym mat is out of the question. 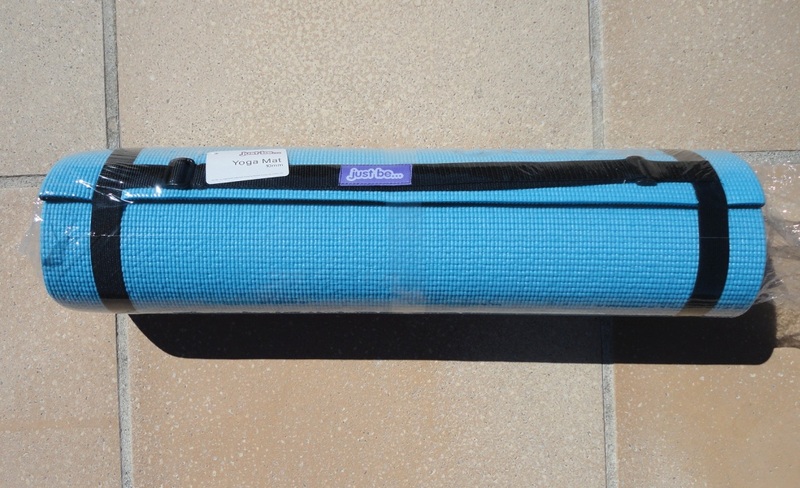 Of the yoga/exercise mats I have tried, this is one of the best, combining function with good looks and cheerful colours. We chose the Blue/Black combo but there are two others: a striking Green/Violet and a perfectly girly Pink/Purple version. 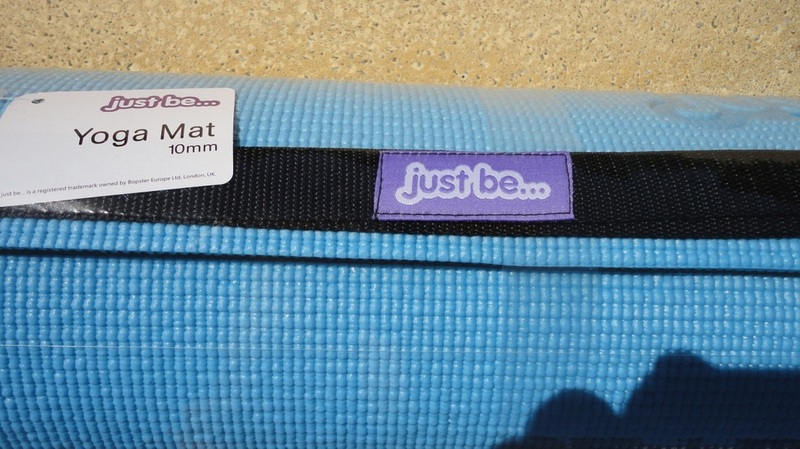 The mat is composed of two foam lawyers bonded together, the total thickness being 10 mm which, as yoga mats go, is quite plush and feels quite insulating. I find it comfortable and perfectly adequate for my needs (a little yoga and stretching exercises). The backing does not slip around and the dense foam cushions my bones, especially when I'm kneeling or doing a shoulder-stand. The difference between an average 4-6 mm thick mat and this one (a genuine 10 mm) is quite noticeable. 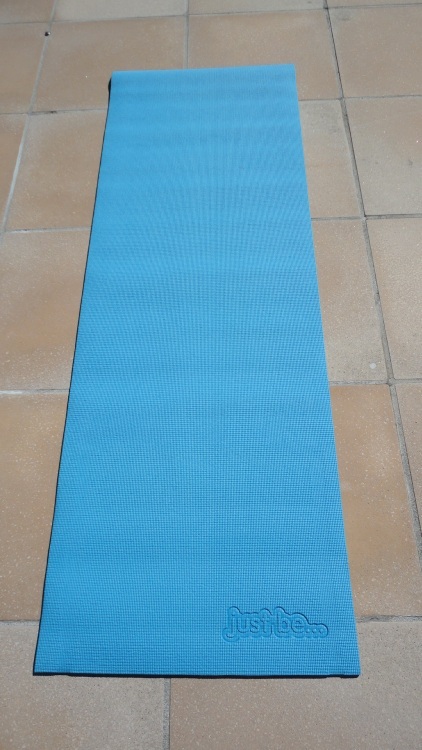 The mat is a good size (180 x 60 cm), long enough for me to fully stretch out, but remains light enough to carry around with ease. A simple elastic harness is provided, which can be slung over a shoulder or carried by hand. Because of the tackiness, rolling and unrolling it is easy and the elastic strap secures it for storage, if you are short on space. The price is competitive, making it good value for the quality. 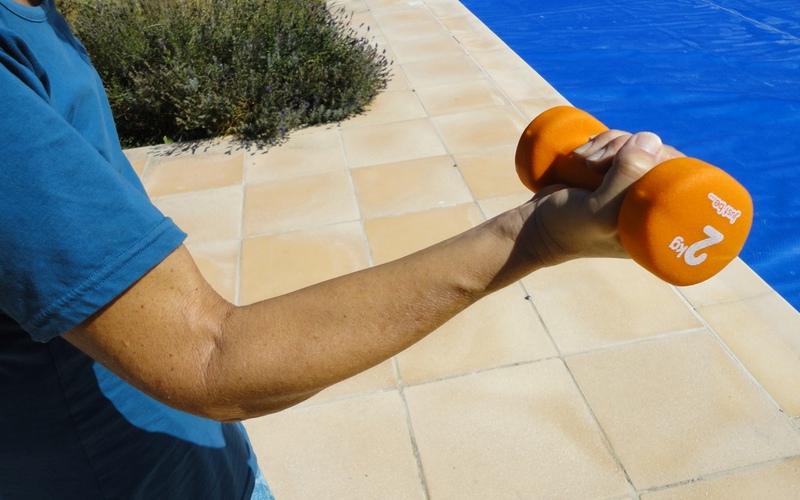 This is an unusual fitness aid particularly targeted to people who suffer from back stiffness and wish to improve their posture and their comfort level. Sadly, that describes a lot of people, not just anyone with a desk-based job but those of us who spend increasing hours in front of a computer screen and driving, as slouching is inevitable. 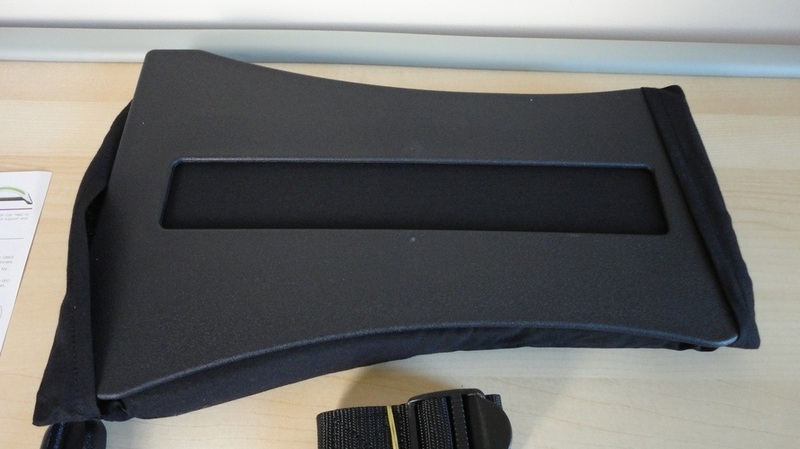 The back support is packed flat and requires two short steps to assemble it. 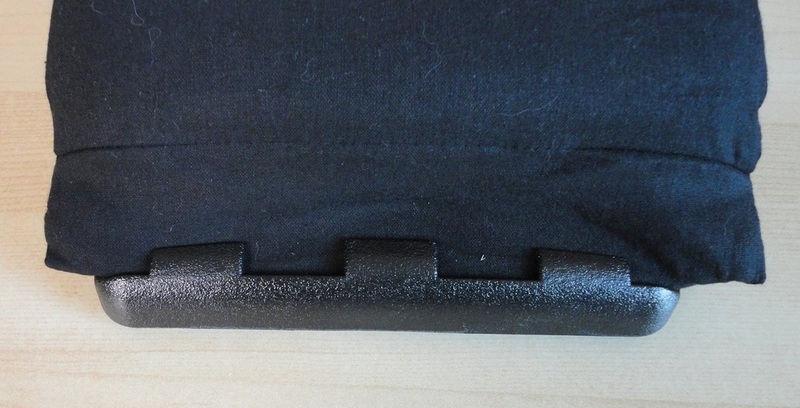 Basically you need to bend and secure the padded portion into the top row of slots at both ends of the flat frame. A little brute force is necessary and two people can do this much more quickly than one, but once mounted, the support is ready for use at any time. At the top of the frame there are two extra rows of notches to increase the curvature and ramp up the stretch, but I doubt that most people will ever need to use them (not for a while anyway). The frame is made of very tough materials, there is nothing flimsy or brittle about the plastic and you get the feeling that it can take a lot of weight. 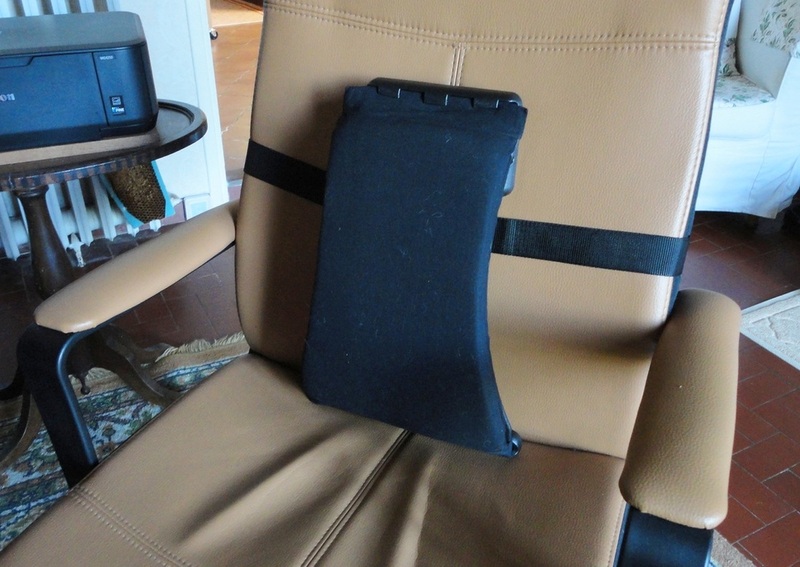 The foam cushion is soft but not squishy and is encased in a heavy-duty canvas sleeve which is removable for washing. 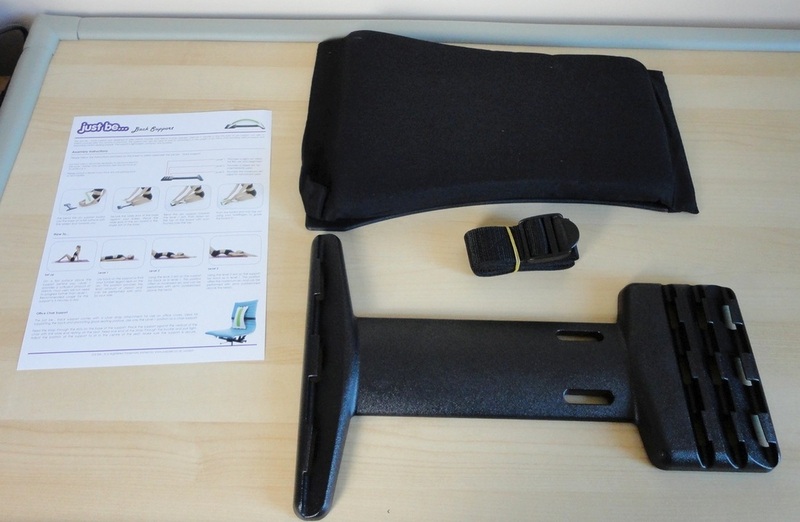 The back support can be used in two different ways: as a permanent posture improver, secured to your everyday chair or even your car seat (a tough webbing-type strap is provided) or as a back stretcher to be used for a few minutes at a time. I had a mild case of scoliosis as a teenager and later a horseback riding injury (cracked tail bone) so my back is definitely prone to stiffness and soreness. I use this support in both fashions. Strapped to my computer chair it does a superb job of providing a firm but comfortable support which keeps my shoulder blades more open and prevents a lot of neck and lower back strain. Placed on the floor, I stretch my whole back over it for 5 minutes or so at a time when I take a break from sitting at my desk. It's difficult to appreciate the effect from looking at the photographs. When I first started out, I could not even touch the floor with my head. However, after a few days, my back started to relax into the curve and I increased the difficulty by placing my arms above my head. For now that is enough, but should I feel ambitious, there are always those two extra rows to engage. Laying on the floor and stretching my back is actually what my osteopath recommended and now I can do it with the added challenge of the curve in my back. 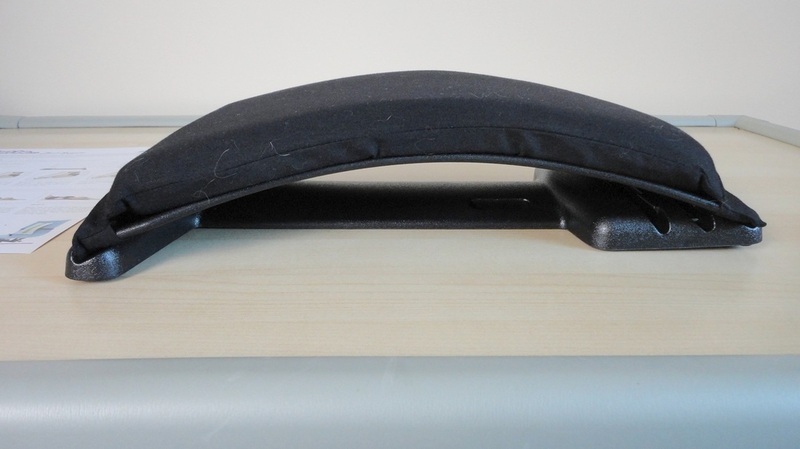 My desk chair is ergonomically designed and feels comfortable enough but now that I have felt the benefits of this additional back support, it seems strange to go without and I can feel myself hunching over. It's the sort of thing you don't know you need until you get one. 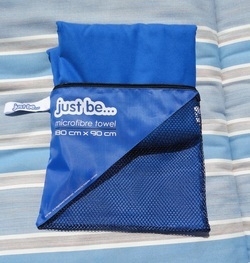 I love microfibre towels and have now tried quite a number of different brands and types. Basically microfibre is a man-made, ultra-light material that has the ability to absorb much more moisture than traditional cotton towels, dries in a fraction of the time and feels just like the chamois we use to buff up cars. Drying yourself with microfibre is a matter of patting your skin dry rather than vigorous scrubbing, and feels quite different at first. Once tried, I was hooked. A full-size towel can be folded down to a tiny size which takes up almost no space in my gym or pool bag and weighs next to nothing. On an average summer day, a microfibre towel is dry to the touch in less than an hour. 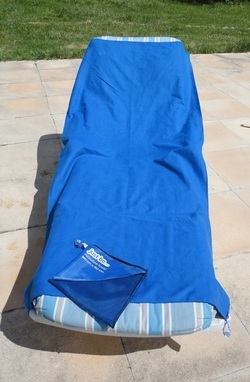 Ideal for the swimming pool, but also as a post-shower towel. The particular composition of microfibre requires special washing. 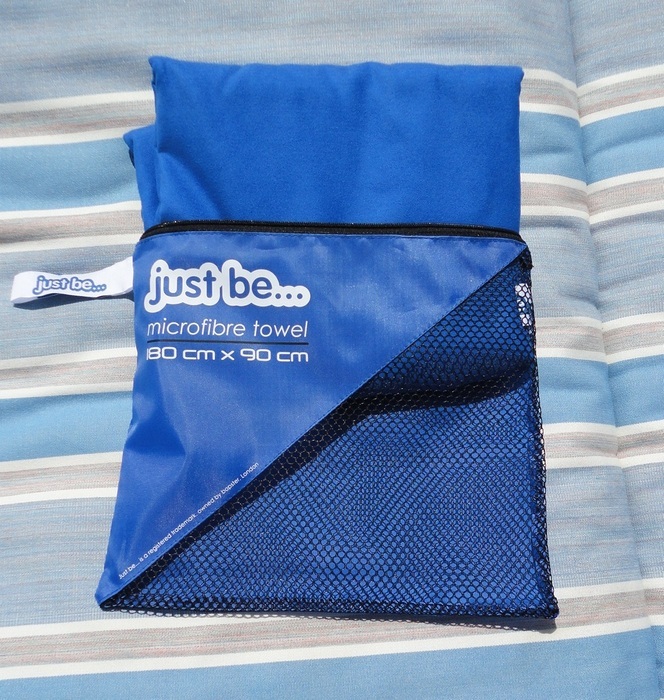 Having done a little research on how to clean microfibre, I found that out it is best to wash it separately or only with other microfibre items. Key points: cool water (30°C), delicate cycle, and air drying (no tumble drier). Also avoid adding conditioner (it diminishes its gripping action and absorbing power); do not add to a mixed load (lint is picked up from other fabrics); and use as little detergent as possible, especially if the towel is not really oily or dirty. The main thing with microfibre is to keep the air spaces open and avoid anything that could cause clogging. Personally, I always hand-wash the first time, to disperse any residual dye, and thereafter use the delicate cycle and wash with similar fabrics. 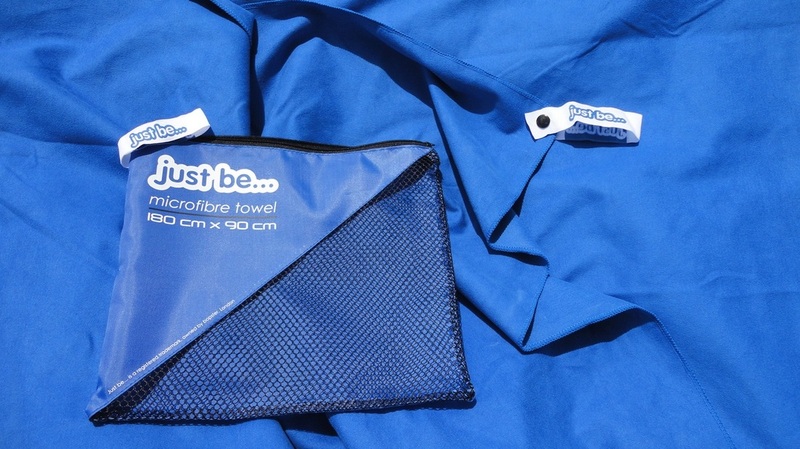 As far as microfibre beach towels go, this brand has a very competitive product. 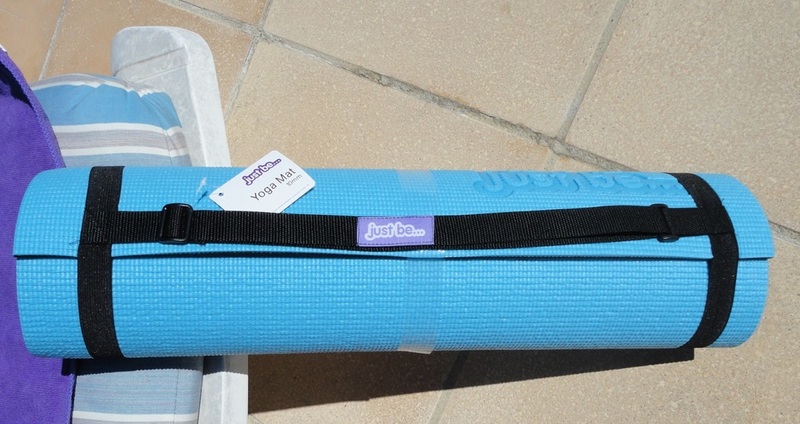 The size I am reviewing is 90 x 180 cm, big and long enough to completely cover a sunbed (there is a smaller size, 80 x 130 cm, more suitable for the gym or pool bag). The colours are bright and cheerful and the manufacture is impeccable: careful stitching, a sturdy hanging loop and a well-made little storage bag with a mesh panel to facilitate drying, even when the towel is folded.